Director: Giuseppe Allegra, Milan. From the announcement printed by the Majorana Centre months before the meeting started. Lectures/Lecturers: Probability Distribution of Structure Factors/G. Allegra; Origin Fixing/G.T. De Titta; Symbolic Addition/C. Giacovazzo; Multisolution Methods/H. Hauptman; Phase Refinement and Extension Techniques/I. L. Karle; Multiple Phase Relationships/J. Karle; Theory of Cosine Invariants/P. Main; Theory of Inequalities/R. Norrestam; Relationships between Relationships/D. Sayre; Matrix Methods/H. Schenk; The Theory of Inequalities/G.M. Sheldrick; Use of Chemical Information/D. Viterbo; Magic Integers/M. M. Woolfson; Application to Macromolecules. The actual contributions are 'buried' into three volumes of collected lecture notes. Participants recall the musical events after dinner in the Madonna room, when the Karles were challenging the younger couples dancing cheek-to-cheek. It is worth noticing five out of these fourteen speakers were 'students' at the Erice Direct Methods course in 1974. 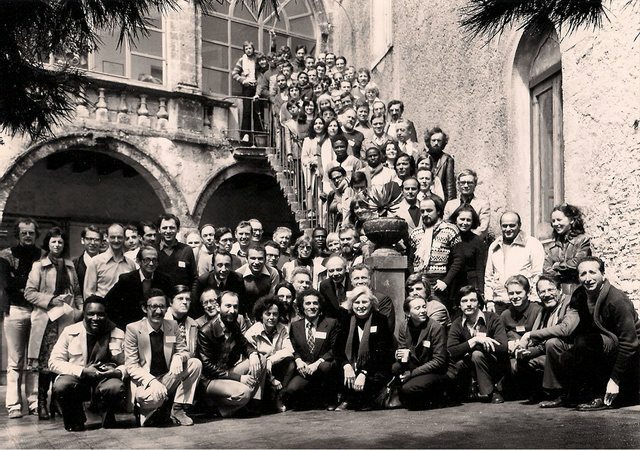 Telegrams were sent to David Harker, Medical Foundation, Buffalo and John Kasper, General Electric, Schenectady, with the words: Thirty years after your pioneer work crystallographers at Direct Methods School Erice Sicily send their sincere greetings. Due to colds and coughings gathered during previous Erice meetings, to celebrate the fifth crystallographic event participants were donated a wool scarf made in Erice, as a souvenir; in order to encourage them to wear the scarf, the organizers stuck sheets on the walls in Erice with a warning 'Crystallographers, protect your neck!' Soon after the meeting, the biophysicists came for their school and, seeing those sheets still hanging on the walls, were asking themselves what sort of dangerous life crystallographers had been experiencing a few days earlier! Kneeling at front: B. Sanni, V. Pavone, A. L. Spek, W. Fischer, I. Vickovic, M. le Bars, E. Arzi, I. Karle, Z.Lipkowska, Z. Dauter, E. Duée, H. Kuppers, L. Riva di Sanseverino. 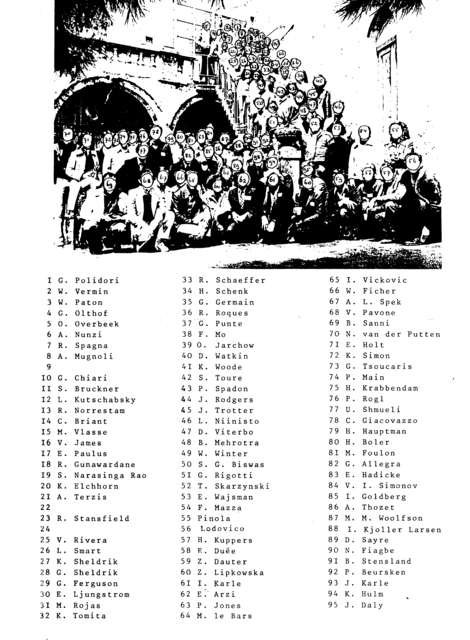 A full identification key is available separately, listing all participants in the photograph as: 1 G. Polidori, 2 W. Vermin, 3 W. Paton, 4 G. Olthof, 5 O. Overbeek, 6 A. Nunzi, 7 R. Spagna, 8 A. Mugnoli, 9 ?, 10 G. Chiari, 11 S. Bruckner, 12 L. Kutschabsky, 13 R. Norrestam, 14 C. Briant, 15 M. Vlasse, 16 V. James, 17 E. Paulus, 18 R. Gunawardane, 19 S. Narasinga Rao, 20 K. Eichhorn, 21 A. Terzis, 22 ?, 23 R. Stansfield, 24 ?, 25 V. Rivera, 26 L. Smart, 27 K. Sheldrick, 28 G. Sheldrick, 29 G. Ferguson, 30 E. Ljungstrom, 31 M. Rojas, 32 K. Tomita, 33 R. Schaeffer, 34 H. Schenk, 35 G. Germain, 36 R. Rogers, 37 G. Punte, 38 F. Mo, 39 O. Jarehow, 40 D. Watkin, 41 K. Woode, 42 S. Toure, 43 P. Spadon, 44 J. Rodgers, 45 J. Trotter, 46 L. Niinisto, 47 D. Viterbo, 48 B. Mehrotra, 49 W. Winter, 50 S. G. Biswas, 51 G. Rigotti, 52 T. Skarzynski, 53 E. Wajsman, 54 F. Mazza, 55 Pinola, 56 Lodovico Riva di Sanseverino, 57 H. Kuppers, 58 E. Duée, 59 Z. Dauter, 60 Z. Lipkowska, 61 I. Karle, 62 E. Arzi, 63 P. Jones, 64 M. le Bars, 65 I. Vickovic, 66 W. Ficher, 67 A. L. Spek, 68 V. Pavone, 69 B. Sanni, 70 N. van der Putten, 71 I E. Holt, 72 K. Simon, 73 G. Tsoucaris, 74 P. Main, 75 H. Krabbendam, 76 P. Rogl, 77 U. Shmueli, 78 C. Giacovazzo, 79 H. Hauptman, 80 H. Boler, 81 M. Foulon, 82 G. Allegra, 83 E. Hadicke, 84 V. I. Simonov, 85 I. Goldberg, 86 A. Thozet, 87 M. M. Woolfson, 88 I. Kjoller Larsen, 89 D. Sayre, 90 N. Fiagbe, 91 B. Stensland, 92 P. Beurskens, 93 J. Karle, 94 K. Hulm, 95 J. Daly. Identification key for the participants at the 1978 Erice Direct Methods Course. 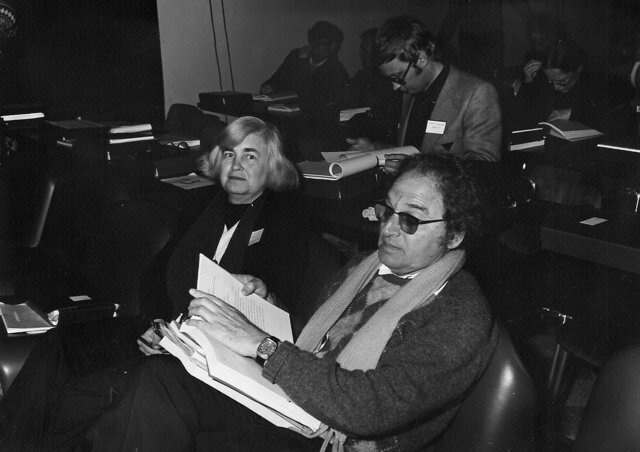 Isabella Karle and Herbert Hauptman, 1978 Erice School on Direct Methods. 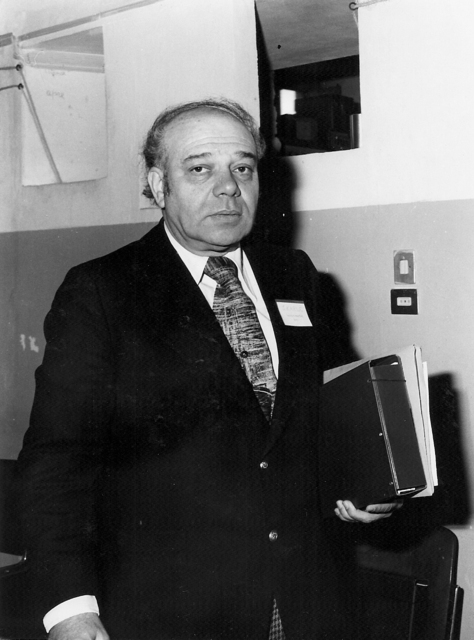 Jerome Karle, 1978 Erice School on Direct Methods.